After having this piece for a couple of years and not knowing exactly what I wanted to do with it, I am excited to share it’s new look with you. It really wasn’t in bad condition at all but the upholstery didn’t agree with me. I thought about trying out the ever popular painting of the fabric but chickened out after reading about how people who loved it in the beginning ended up dissatisfied with the way it wears a few months later. I would rather only take on a job once if I can help it. 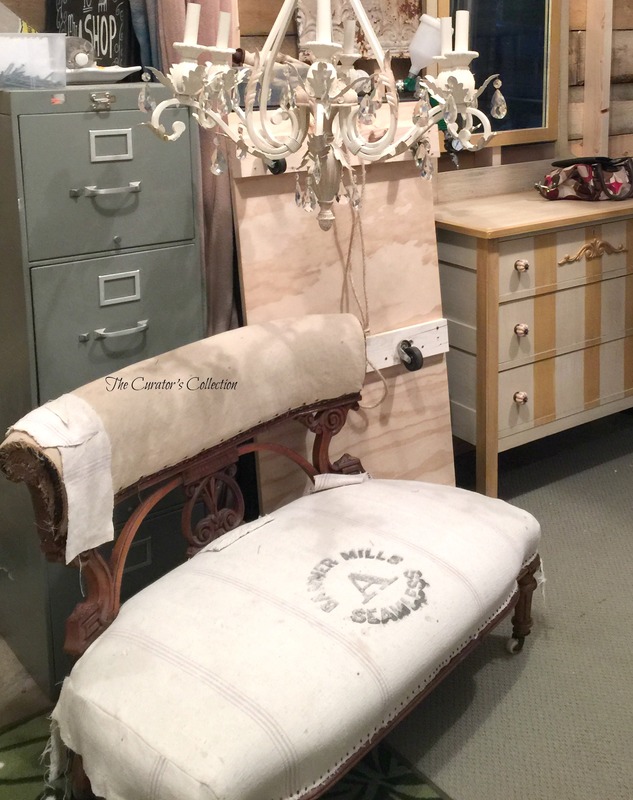 Antique grain sacks are a rare find in antique stores these days, they are so popular that if you find one (no matter the condition) you’d better scoop it up right away! I found mine on a trip to Edmonton to see my uber talented friend Marie from The Interior Frugalista. She was a vendor at a market there and I took a chance and surprised her. We had never met in person and this was the perfect opportunity to do so as well as check out some of the amazing antique malls there. Let’s just say the trip did not disappoint! Not only did I get to meet my friend and give her a hug in person but I managed to snag an actual antique grain sack!! Woo hoo! I knew exactly what it was going to be used for … my settee!! Of course there was a little sewing and piecing together of it to make it work but here is how it turned out! 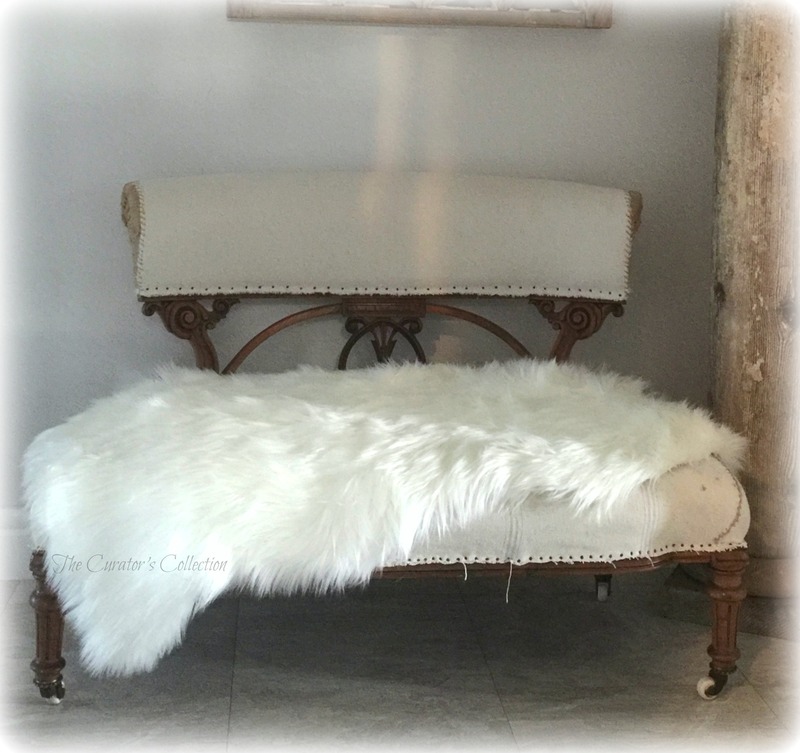 I wanted it to have a bit of an unfinished antique raw feel so I left the edges to being frayed and used upholstery tacks instead of using fancy trim. 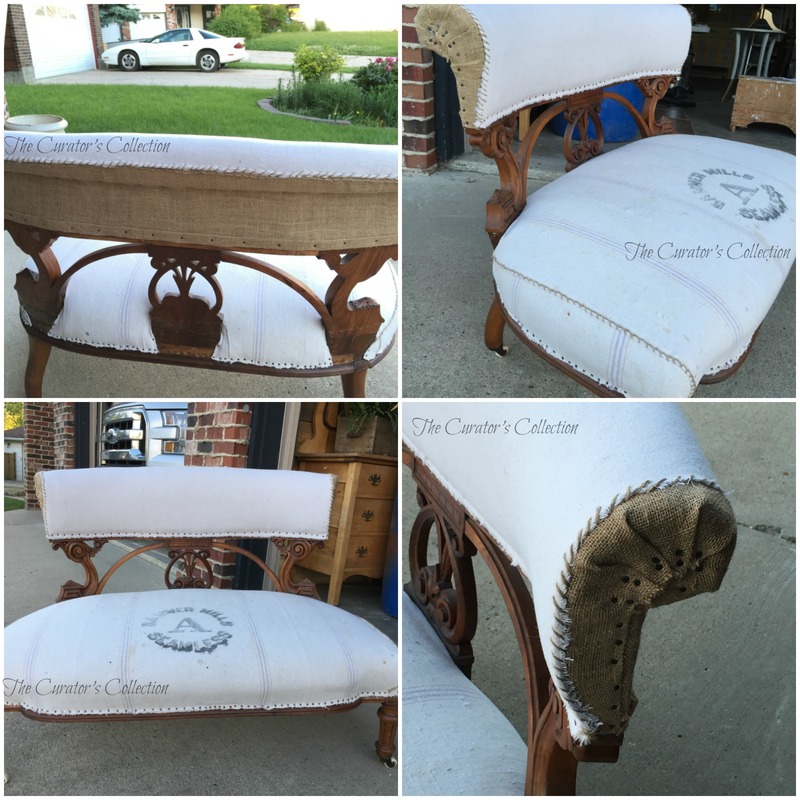 Here are some photos of the whole upholstering process. It is not a tutorial by any means but I did add in a few tips on how I did it. After it was stripped naked, I pieced it back together using my newly acquired grain sack and some burlap. The entire piece is hand tacked and hand stitched together. This is where patience is tested! 100’s of tacks to remove and 100’s to put back! next the hammering in of the tacks . . .
Next I used some thin twine in a blanket stitch to give detail to the seams on the seat cushion. 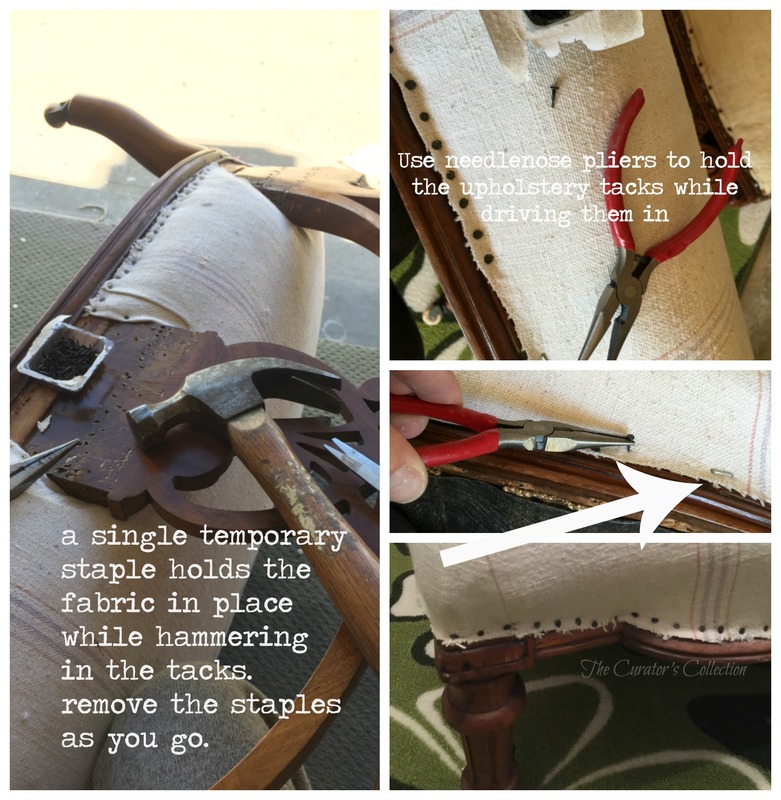 I also used the same twine in a running stitch to attach linen to the burlap on the backrest. you can see the backrest here . . . Unfortunately I was not completely fond of the stamp on the grain sack and it does have a few remaining stains on it even after washing it. No worries though as I just laid a fur throw over it. Now the logo is hidden and the grain sack is protected from further wear. The logo isn’t totally bad but I would have preferred something a little more pretty. I couldn’t be choosy since I have yet to come across a grain sack this size. I love how it turned out and I’m so happy I decided not to paint the original fabric. She looks stunning in my entryway and makes my heart sing every time I walk by her! I’m totally in love with this!!! Awesome job! Thank you Terri! I hope you have an amazing day! I love how it turned out, great job!! Thank you for taking the time to leave a sweet comment! It’s so appreciated Cheryl! I hope you have a fantastic week! I love how this came out. I will be referring to your tips when I get ready to redo a chair that has to be in this style. Thank you Debra! I love the semi unfinished look of antique furniture, it’s not so formal feeling but is still pretty. I hope you have a great week! Marie you are super sweet! Thank you for always being so uplifting! Yes, I found the grain sack in the antique mall by your booth. It was upstairs in that little yucky(ish) booth by the discount area. I may have even gasped loud enough to make people look at me ha ha! Thank you for pinning and sharing too! Have a great rest of your week! Applause-applause-applause girl! LUV it! Perfect finishes and detials—AND those columns~o.m.g! Thank you! Thank you! Thank you! (blushing!) 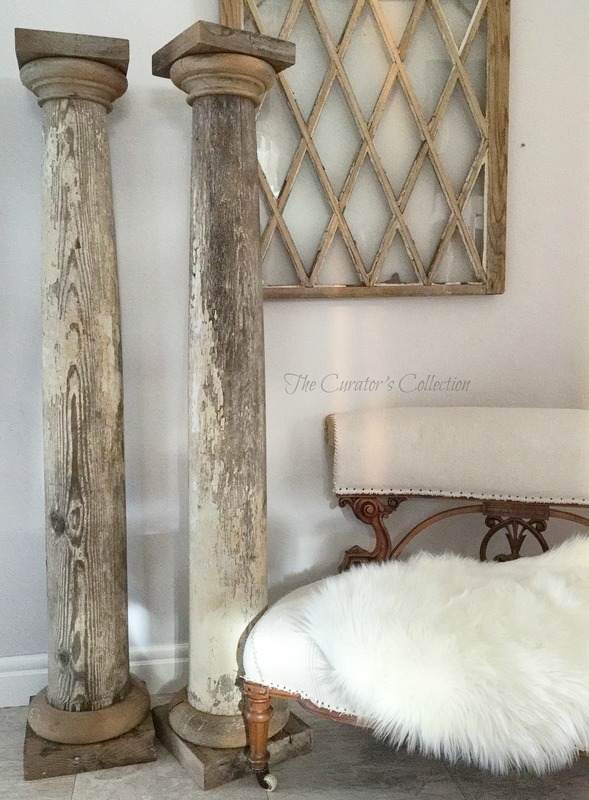 … those columns make my heart go pitter patter too! I hope you have a great day Catherine! We are sharing this beautiful chair on The House of van Gogh’s Facebook page this evening. Fabulous detail! 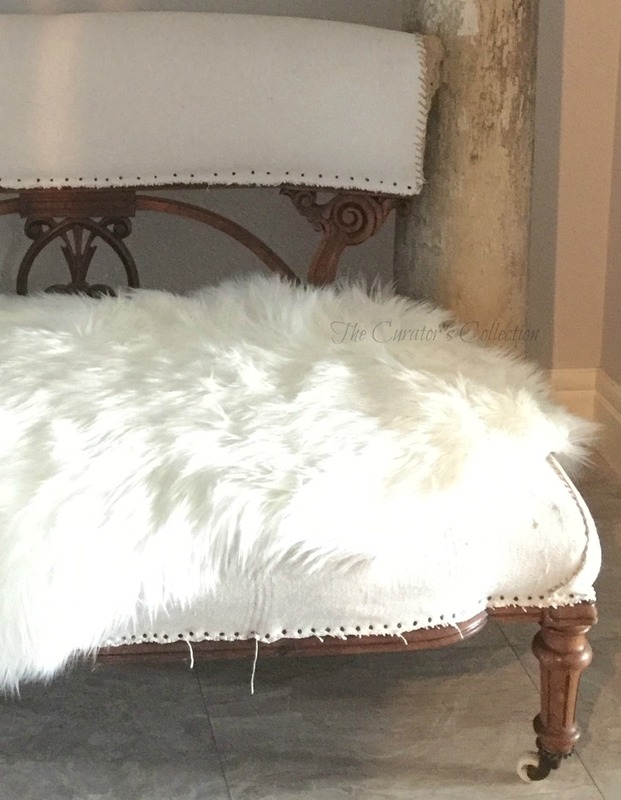 This chair is visually appealing so I bet it is just outstanding when people get to touch the grain sack seat and the shabby paint. Love Love Love this chair. Congratulations! Thank you so much Judy for the share and the high compliments! I hope you have an amazing week! 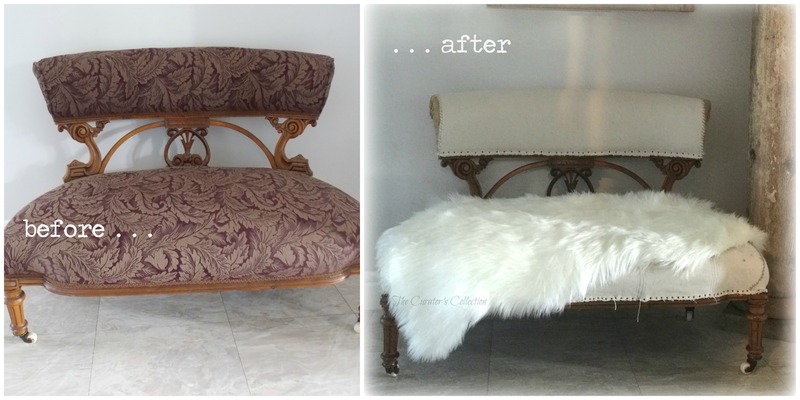 Terry that is one beautiful transformation for such a special settee. The choice of the grain sack really shows off the shape and uniqueness of the furniture. Thank you so very much Mary! Your opinion means a lot to me and I thank you for taking the time to visit and comment! I hope you have an amazing day!